Sauté the Onions and Red Peppers till tender. Dont over cook them. Set them aside to cool a bit. Put the Crab and the Borsin Cream Cheese in the bowl mix and the sautéed veggies and herb of your choice and salt and pepper mix thoroughly. Roll the mixture into small balls, and then flatten to make a cake shape. 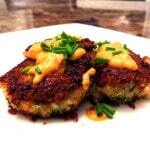 Roll the Crab Cakes into the Panko Crumbs. Set the cake on a plate and put in the fridge for an hour so when you cook them they will hold their shape. You are going to love this sauce and want to put it on everything! Try it as a dip for Bacon Wrapped Scallops, Pan Fried Prawns, or over Chicken Breast. Or just drink it lol.